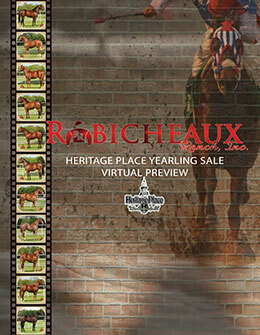 Robicheaux Ranch, Inc. released their fifth annual Heritage Place Yearling Sale virtual yearling preview today. BREAUX BRIDGE, LA–SEPTEMBER 7, 2018—Robicheaux Ranch, Inc., is pleased to announce the release of their fifth annual Heritage Place virtual yearling preview. The online book features 18 yearlings to be sold during the three-day sale in Oklahoma City, Oklahoma September 20-21-22, 2018. "We look forward to showing this exceptional group of yearlings and invite you to take a sneak peek prior to the sale," says ranch manager Ryan Robicheaux, "our virtual yearling previews provide trainers and owners early access to photos and catalog pages at the push of a button, which is an added bonus to not only our consignors, but potential buyers." CLICK HERE to view the Robicheaux Ranch Heritage Place virtual yearling preview. Robicheaux Ranch, Inc. has provided the racehorse industry with first rate services you've come to rely on for nearly twenty years. Specialized reproduction, stallion management, and sales preparation are among the list of services provided by the Breaux Bridge, Louisiana breeding facility. For more information on Robicheaux Ranch, Inc. call 337-845-5130 or visit www.robicheauxranchinc.com.